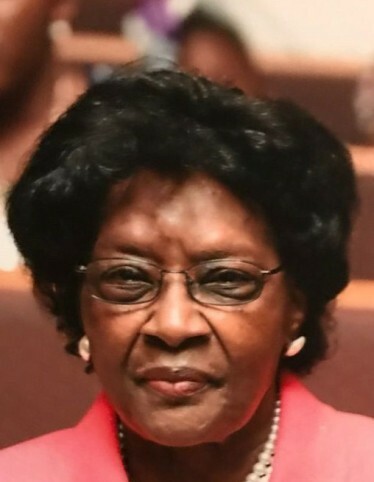 Mrs. Shirley McCoy Batts, 79, of 1317 Parkside Drive, Wilson, NC, passed away on February 11, 2019 at her home. The funeral service is scheduled for Sunday, February 17, 2019 at 3:00 pm at Brown Chapel FWB Church, 1507 Hadley Street, Wilson, NC. Pastor Terry Joyner will deliver the eulogy. A public visitation will be held on Saturday, February 16, 2019 from 3:00 pm until 6:00 pm at Stevens Funeral Home, 1820 Martin Luther King, Jr. Parkway, Wilson, NC. Mrs. Batts was preceded in death by her, husband Rudolph Batts; three sons, Kenneth Ray Williams, Vincent Charles McCoy and Billy Earl Williams; her parents, John Taylor and Annie McCoy; stepfather, Leon Sharpe and her brother, James Daniel Taylor. She leaves many cherished memories to: two sons, Christopher Williams and Gregory Williams (Felicia) both of Wilson, NC; ten grandchildren; fifteen great grandchildren; one great great grandchild; three sisters, Annie McCoy Witherspoon (Martin) of Wilson, NC, Sharon Taylor- Fernandes (Braxton) and Anna Williams (Olufisayo) both of Newbern, NC; five brothers, William Taylor, Odell Taylor (Delores), Anthony Taylor (Christine), Michael Taylor (Emma) and Tyrone Taylor all of Newbern, NC; one sister-in-law, Keywanna Taylor of Fairmont, NC; a host of nieces, nephews, cousins, other relatives and friends. The family will receive friends at the home where they will assemble on Sunday at 2:00 pm in preparation for the funeral procession.